Gone Girl was one of the most anticipated movies of 2014. It’s based on the best-selling novel by Gillian Flynn, directed by David Fincher and starring Ben Affleck (Nick Dunne) and Rosamund Pike (Amy Dunne). I loved the book and really liked the movie. There’s a fair share of product placement, but I haven’t found it blatant or in-your-face. To be honest while watching the movie I haven’t even noticed all brands mentioned in this article. Let’s check product placement from Gone Girl. 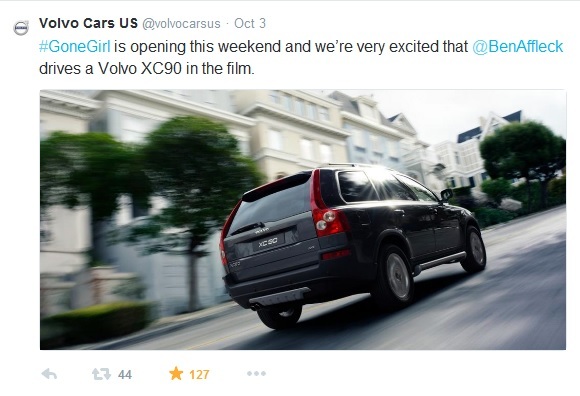 The most screen time was awarded to Nick’s car: Volvo XC 90. Detective Rhonda Boney can be seen drinking Dunkin Donuts coffee in several scenes. During one of the flashbacks we can see Nick and Amy at a party in New York with Amy holding a bottle of Belgian beer Leffe. I’ve asked Leffe if they had something to do with their product placement. In one of the scenes at the beginning of the movie we see Nick with a Mastermind, an old school game and then we saw him and his sister playing a board game. It was The Game of Life. Later in the wood shed we saw a copy of Dominion, along with a giant Sony Bravia TV and a robot dog. Nick (Ben Affleck) wakes up one morning with his sister pressing a cold can of Diet Coke to his forehead. We could also see Nick wearing Boulevard Brewing Co. T-shirt. Apparently Gone Girl wardrobe team approached the brewery (from Kansas City), because the movie was based in Missouri and they wanted to add the local/state aspect. We can also see Nick and Amy wearing New Balance sneakers and a New Balance shoe box. Later in the movie when things don’t go his way, we see Nick eating Dreyers’ ice cream out of the carton. Nick’s lawyer Tanner Bolt was driving Chevrolet Tahoe LT.
During one scene in the second part of the movie Desi Collings (Neil Patrick Harris) says to Amy that his luxury lake house features Netflix and Roku, with the Roku’s name dropping happening without company’s knowledge. Roku admitted that in a reply to my tweet. I don’t want to include spoilers, so I’ll state a few additional placements: we can see one woman in the cabin in the woods enjoys a huge glass of Mountain Dew, while the other eats Fritos and KitKats. There was one unexpected product placement: Fincher placed a bottle Singani 63, a pomace brandy, made by his fellow director Steven Soderbergh. Singani is considered the national liquor of Bolivia and Soderbergh found out about it when he filmed the movie Che. Fincher placed Soderbergh’s bottle as a favor and some of you might have spotted it on a counter in the Missouri home of Nick Dunne. Producers also did another thing right. We could see posters and out of home media with website FindAmazingAmy.com written on them. Sometimes it happens that movie producers or writers forget about domains and don’t register them. This wasn’t the case in Gone Girl. FindAmazingAmy.com is still live and contains relevant information. As I said Gone Girl was full of brands, although in my opinion no particular brand stood out in a negative way. All (or the majority of) brands were there to support the story or to give it a bit of (necessary) realism. Nick also drinks Bulleit bourbon with his sister in an early scene, not sure if you’d noticed that one. What was the bed desi mentioned? I’m curious also – Desi mentioned that bed at his beach house – what was the name of that mattress??? Found it! Saatva Brand Luxury Mattress! The luxury bed mentioned was in fact Savoir Beds (not Saatva). Their website says they are the best beds in the world. @Steven In the bar they also drink Blanton’s. In Margo’s house they drink Bulleit, as you mention. When Amy gets to the lake house, Desi has stocked the fridge with, among other stuff, more Leffe. When I first saw it I thought it was a show of how much care Desi had taken about getting the house perfect for Amy but later on I started wondering whether and how he would have known that that’s what she was drinking when she met Nick and whether it made sense for him to allude to that? And is that a 500 ml bottle of Leffe she is swigging from when they meet or does it just look big because of the angle? What was the brand name of the bed sheets they gave each other? You missed one… the bed. Neil Patrick Harris specifically called out a brand name bed stating it was the best nights sleep ever. It had an odd name and I am trying to find it. Can you help? In the early part of the film, Nick and Amy exchange the same gift of bedsheets. Does anyone recall the brand and if that brand really exists? There was a Walmart sign and KFC sign shown in the film too. Was the brand of sheets they bought each other for an anniversary a real brand? Anybody recall what kind of car Desi drove? Does anyone know the brand of the engagement ring in the movie? I suspect it’s Ballerine from Cartier!? Lauren, I’ve also been desperately trying to figure out the handbag that Amy is carrying when they leave their NY brownstone to move to Missouri. Please re-post it if you or anyone else finds it!! It is proving to be especially difficult because Rosamund Pike has a handbag named after her. @Ashley In the book Desi drove Jaguar. What is the car Desi drives in the movie? Is it a Jag? Yes, I believe he drives Jaguar. What is the phone that Tanner uses when talking with Nick? What was the car amy drove frm home 2 the motel? There is a scene where they are drinking red wine and they are using the same awesome-looking wine glasses from Fincher’s other film, The Girl With the Dragon Tattoo. I have been looking for these wine glasses since that previous movie came out. Does anyone know who they are from? No one noticed what looks to be a Rolex explorer Nick is wearing in a few scenes. That watch was a bit of s stretch in this movie, unless it was meant to play up Nick’s spending habits. How about the tube of Aim? The bed sheets were made by a company called Tessere. I think that they have a thread count of 2000. I’m searching for any place that sells them, anyone know? The car Amy drives while ” missing ” is a 1st gen Ford Aspire. … also known as the Ford Festiva. Would love to know the brand name and design of the comforter and pillows on the bed in the master bedroom and where I can get one.